The gravitational waves created by black holes or neutron stars in the depths of space have been found to reach Earth. Their effects, however, are so small that they can only be observed using kilometer-long measurement facilities. Physicists are therefore discussing whether ultracold and miniscule Bose-Einstein condensates with their ordered quantum properties could also detect these waves. Prof. Ralf Schützhold from the Helmholtz-Zentrum Dresden-Rossendorf (HZDR) and the TU Dresden has studied the basis of these suggestions and writes in the journal Physical Review D that such evidence is far beyond the reach of current methods. As early as 1916, Albert Einstein submitted an article to the Prussian Academy of Sciences in which he demonstrated that moving masses such as giant stars orbiting each other leave behind a dent in space and time, which spreads at the speed of light. These dents are known as gravitational waves, and should move precisely like radio waves, light and other electromagnetic waves. The effects of gravitational waves, however, are normally so weak that Einstein was convinced that they could never be measured. The reason for this skepticism is that gravitational waves are weak. For example, even the quite large mass of the Earth, which orbits the sun at almost 30 kilometers per second, produces gravitational waves with a power of merely three hundred watts. That wouldn't even be enough to power a commercial vacuum cleaner with an Energy Star label. The influence of these gravitational waves is therefore imperceptible. The situation improves when considerably larger masses are involved. When two huge black holes merged at a distance of 1.3 billion light years from Earth, of which one possessed the mass of approximately 36 suns and the other a mass of 29 suns, space and time trembled. During this merger, a mass that measured three times that of our sun transformed into a gigantic gravitational wave, whose remnants reached Earth 1.3 billion years later on September 14th, 2015, at 11:51 AM Central European Time. Because the waves propagate in all directions over such enormous distances and spread to an unimaginably large space, their power was hugely diminished. On Earth, only an extremely weak signal was received, which was registered using two four-kilometer-long perpendicular vacuum tubes in the United States. Two special laser beams shoot back and forth between the end points of these facilities. From the time required for one light beam to reach the other end, the researchers can very precisely calculate the distance between the two points. "As the gravitational waves reached Earth, they shortened one of the two measurement distances by a tiny fraction of a trillionth of a millimeter at both facilities, while the other perpendicular stretch was extended by a similar amount," says HZDR researcher Ralf Schützhold, outlining his colleagues' results. 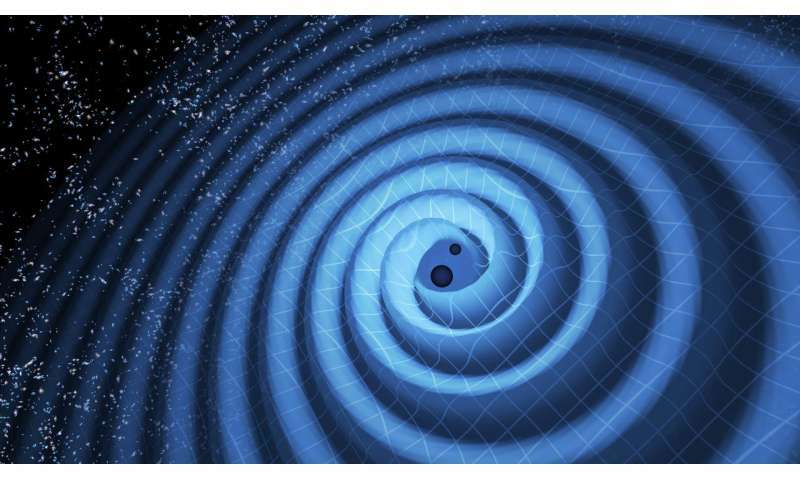 Therefore, on February 11th, 2016, following a detailed analysis of the data, the researchers reported the first direct detection of the gravitational waves predicted by Albert Einstein. Three of the contributing researchers were awarded the Nobel Prize in physics in 2017. Astrophysicists can now use these waves to observe massive events in space, such as black hole mergers or supernovas. Physicists are now asking whether it's possible to build facilities that are easier to deal with than the four-kilometer-long perpendicular vacuum tubes. Some suggest using Bose-Einstein condensates, a form of matter that Satyendranath Bose and Albert Einstein predicted back in 1924. "Such condensates can be thought of as heavily diluted vapor from individual atoms that are cooled to the extreme and therefore condense," explains Schützhold. Researchers in the United States created a Bose-Einstein condensate in 1995. At extremely low temperatures, only very slightly above the absolute zero of minus 273.15 degrees Celsius, most atoms of metals such as rubidium exist in the same quantum state, forming a chaotic hodgepodge as vapor at higher temperatures. "Similar to laser light particles, the atoms of these Bose-Einstein condensates move, so to speak, in synchronization," says Schützhold. Gravitational waves, however, can change sound particles or sound quanta, which physicists call phonons, within synchronized atom condensates. "This is a bit similar to a big vat of water in which waves generated by an earthquake change the existing water waves," says Ralf Schützhold, describing the process. However, when the head of HZDR's Theoretical Physics Department took a closer look at the fundamentals of this phenomenon, he ascertained that such Bose-Einstein condensates had to be several orders of magnitude larger than is currently possible in order to detect gravitational waves emanating from merging black holes. "Today, Bose-Einstein condensates with, for example, 1 million rubidium atoms are obtained with great effort, but it would take far more than a million times that number of atoms to detect gravitational waves," says Schützhold. However, a kind of vortex is formed within a Bose-Einstein condensate in which gravitational waves directly generate phonons that are more easily observable. "But even with such inhomogeneous Bose-Einstein condensates, we are still orders of magnitude from detecting gravitational waves," says the physicist. The HZDR researcher nevertheless provides a hint as to possible proof: If the noble gas helium is cooled down to less than two degrees above absolute zero, a superfluid liquid is formed that is not a pure Bose-Einstein condensate, but contains just under 10 percent of such synchronized helium atoms. Because much larger quantities of this superfluid helium can be produced, many orders of magnitude more Bose-Einstein condensate atoms can be created this way than with direct production. "Whether superfluid helium is really a way to detect gravitational waves can only be shown with extremely complex calculations," says Schützhold. The mini-detectors for gravitational waves still therefore lie some time in the future. From other articles published at the time of this detection, the resulting merged BH seems to have been detected as 36+29-3 solar masses, i.e. the 3 solar masses detected as gravitational waves derived directly from the merged BHs as conversion of some of their mass-energy. However, wouldn't his converted mass-energy have been within each (and then the merged) event horizon, and, if gravity behaves similarly to light, not have been able to achieve escape velocity for us to detect it? I am not a specialist in general relativity, but bear with my naive understanding: as you described, in the 11 mergers resulting in black hole candidates, some 10 % of incoming mass is converted to outgoing gravitational wave energy. Either black holes, or in one case neutron star, binaries have been seen, we are still waiting for the rarer mixed black hole/neutron star merger. If you look at the merger simulations, they do a good job of describing it. The spinning pair gets distorted by their mutual gravity and spin effects as they near the collision, and the asymmetry creates space time curvature changes around them. After merger the curvature settles into a stable configuration, and the excess potential energy is radiated away. Nope. 36+29 *-* 3. Energy doesn't come out of nowhere. As far as gravity goes, apparently (and this is not only observational but GRT theoretical as well), it's one of the forces capable of traversing the EH. EM is also capable of this as otherwise a black hole could not be electrically charged. And there is both observational and theoretical evidence for this as well. Oh, and BTW, detecting GWs calls for large structures, not small ones. That's why kilometers-long experiments are required, not BECs that are at most micrometers wide. This is duh ummm. However, wouldn't his converted mass-energy have been within each (and then the merged) event horizon, and, if gravity behaves similarly to light, not have been able to achieve escape velocity for us to detect it? Thanks in advance.